I'm checking collision for a platformer character as shown in #1. The red dots are the pixels that are checked and the grey lines indicate the axes they pertain to. I like the results I get from checking collision this way (versus, say, bounding box). Everything works exactly as I'd like it except for one problem: crush detection. In the following images, the light blue box represents the ground, the orange box is an object, and the arrows indicate direction of movement. The simple solution to detecting when the player is crushed is to see if the collision points on opposite sides are both triggering. If they are, the player is being crushed. In #2, you can see a normal crush scenario. The player is grounded and the top collision points are intersecting with the falling object. This triggers a crush. #3, 4, and 5 present problematic scenarios. In #3, the player is moving toward the object, which is moving up. A right-side collision point is hitting the object, causing a collision and stopping the player. Now, if the object continues to move up and the player continues to move right (as shown in #4), the object clears the players right-side collision point and the player moves to the right. But now, having done so, the object is intersecting a top collision point causing an unwanted vertical crush. A similar scenario is shown in #5. Two objects are far enough apart for the bottom collision points to clear, allowing the player to fall, but no to so far as to allow the side collision points to clear, causing an unwanted horizontal crush. I've been racking my brain on a solution, but nothing I've come up with has worked particularly well, so I'm wondering if anyone out there has an idea or insight into how to solve these problems. I think you'll have to take the box's movement into consideration. That is, only crush if the box is moving towards the player. This is similar to other problems in platformers, where the movement is important. E.g. for platforms that you can jump through and onto from below, don't check collision if the player is moving upwards. So a block can crush the player from above only if the block is moving downwards; from below only if the block is moving upwards; from the left only if the block is moving to the right, and so on. Have the "crush test" points be inside the gray box shown in your image #1 - i.e. kill the player only if you detect a hit on one of the pixels there. As someone who grew up with 80s platformers, my first comment is that the contact points must be exactly on the sprite, not anywhere outside it. There were few experiences more frustrating than dying when a weapon/crusher/enemy was clearly several pixels away from your character - and that kind of experience is what stops people playing. With that in mind, the idea of having separate points for horizontal and vertical collision simply doesn't fly. So your cases 3 and 5 don't exist. As for collision detection, as has previously been said, you need to consider movement direction, and you have two axes of movement to consider. If a crusher is down, the player should not be able to walk forwards - it should act like a wall. So with horizontal and vertical detection points in the same place, you couldn't get case 4, even before you add movement direction to the mix. The upward-moving crusher adds extra complexity. If it's so quick that the player has no chance to escape, then OK. But if it's slower, the player will expect to be able to run over the rising platform and jump off the other side. The player sprite rises upwards on the crusher, and crush detection happens at the ceiling. You could make the object "harder" than the ground, meaning that, assuming collision, the player gets pushed "into" the ground, as opposed to being pushed "into" the moving object. This assumes the player is not able to push themselves "into" either objects or ground. If you can detect overlap of objects without having to wait for them to display, a simple approach is to process motion for the player and other objects independently, one pixel at a time, with separate collision checks afterward. If the player is moving freely and would collide with its object as a result of such motion, back it off. If a collision occurs with an object as a result of the object's motion, check whether the player can move in the same direction as that object. If so, move the player. If not, handle the "crush" situation appropriately (damaging or killing the player and/or moving the colliding object backward, depending upon the contact). 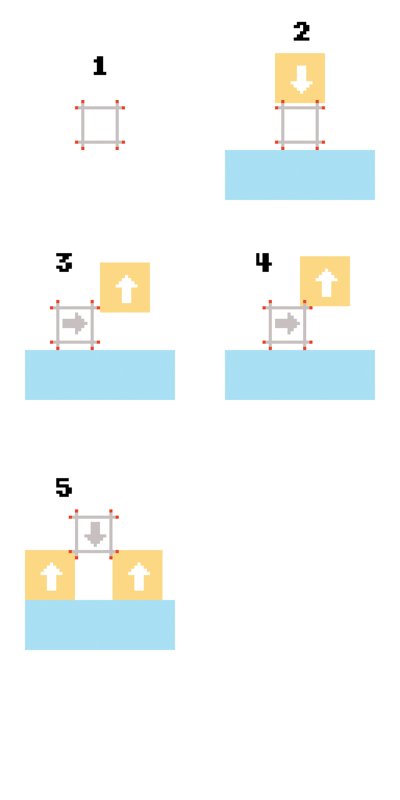 BTW, if only a limited number of combinations of shapes can collide, it may be useful to pre-calculate "collision-detection" bitmaps such that if a pixel is set in the first sprite at offset (x1,y1) and in the second at offset (x2,y2) of the second, the pixel at offset (x1-x2,y1-y2) will be set in the collision map. Such a pre-calculated collision map will make it possible to detect collisions between the two sprites by checking the state of a single pixel in the collision map. It takes two objects to crush a player. Your crush detection should check for the player being between two objects, the space between them being equal to the size of the player, and the distance decreasing. The idea is: why to check if the crusher is moving when we actually care if the character is moving. Both can answer if the crush is false positive caused by the character's own movement or true crush by the crusher object movement. If crush is confirmed the second time then proceed with crush. Not the answer you're looking for? Browse other questions tagged 2d collision-detection collision-resolution platformer or ask your own question. How can I detect collision between a circle and a rectangle? In a 2D platform game, how to ensure the player moves smoothly over sloping ground? How can I test if my rotated rectangle intersects a corner? How do I detect and handle collisions using a tile property with Slick2D? How to handle the top of a slope in a 2D tile-based platformer? How can I get visually accurate collision normals with sphere collisions?